And this chart from Fox News shows how “undeveloped” the child really is. The set of charts below provide a view of contractions and expansions (and stock prices) since the start of the 1960s (I ignore the 1980-81 cycle). The scales are the same for all contractions and for all expansions to make comparison easier. Some contractions are short and shallow, some are longer and deeper, but none was as long and as deep as the 2007-09 contraction. That one was also unique in that NGDP growth turned negative. Observe that until that point, the recession was nothing to call home about, but then we experienced the consequence of the greatest monetary policy error of the post war period. The 1960-61 contraction was mild and stock prices remained flat but picked up before the trough. The ensuing expansion was long and robust. Notice, however that half way through, stock prices flattened. 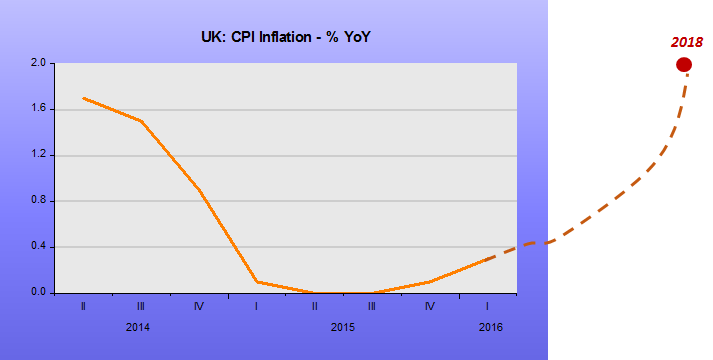 The reason is that inflation began an upward trend, following the faster rise in NGDP. 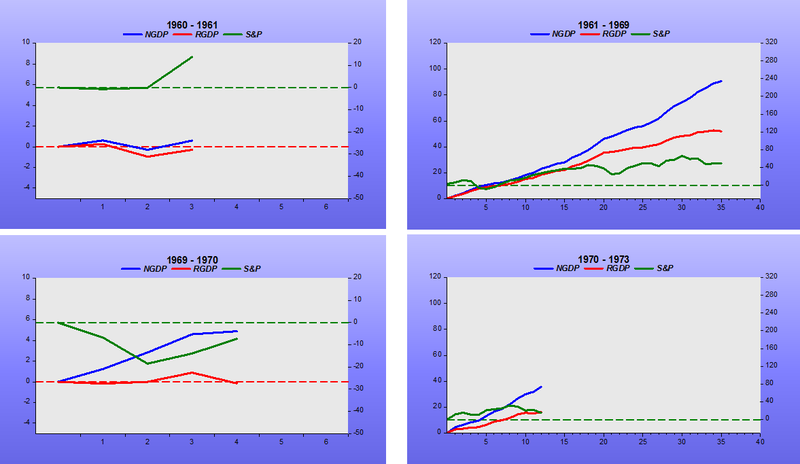 In the 1969-70 contraction, RGDP stayed put, but stock prices fell significantly. Inflation had become entrenched. The expansion phase was short, with the strong increase in NGDP guaranteeing that inflation kept rising, keeping a lid on stock prices. The 1973-75 contraction is the prototype supply shock recession. 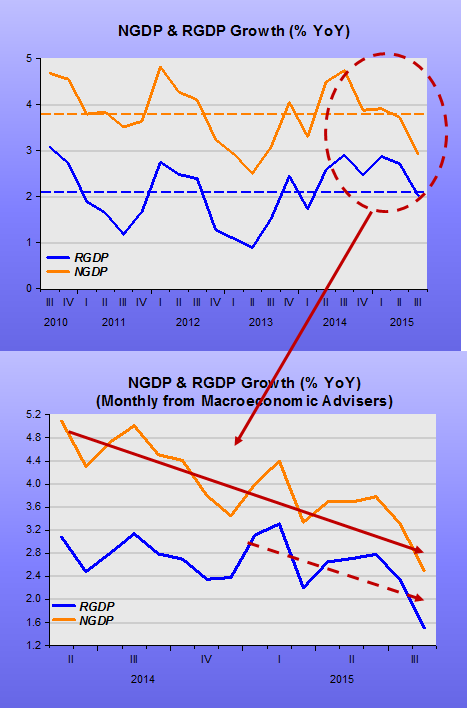 NGDP growth grew robustly, fanning inflation, but restraining the fall in real output. Stock prices plunge. The expansion that followed was characterized by high NGDP (inflation) growth with real output and stock prices subdued. The 1981-82 contraction is the prototype demand shock recession. 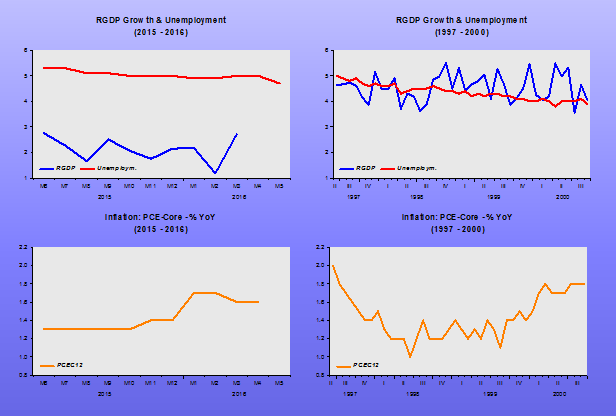 NGDP growth (and inflation) was brought down forcefully. Although real output fell by more than in 1973-75, stock prices dropped by much less and picked up before the trough. The expansion was long and robust. 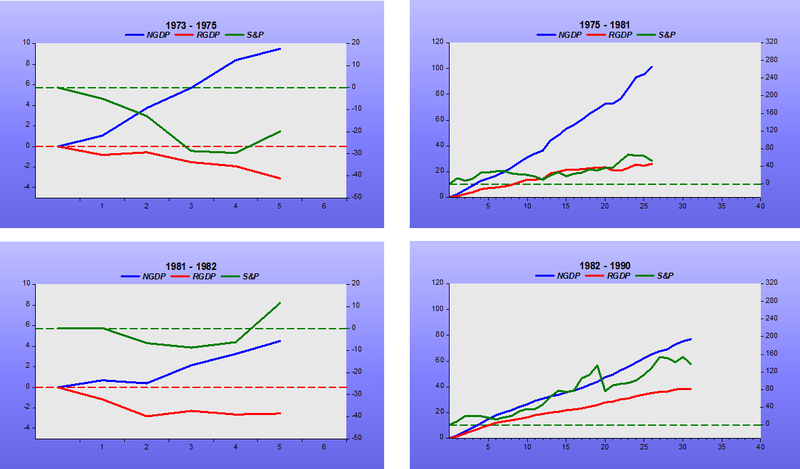 The 1987 stock crash did not affect real output growth. The 1990-91 contraction was short and shallow. Inflation was brought down to the 2% level. Stock prices were not much affected. This was followed by the longest expansion in US history. The consolidation of nominal stability that began in in previous expansion is behind the exuberance of stock prices. In the 2001 contraction, real output didn´t fall at all. The drop in stock prices reflects the Enron et all balance sheet shenanigans. 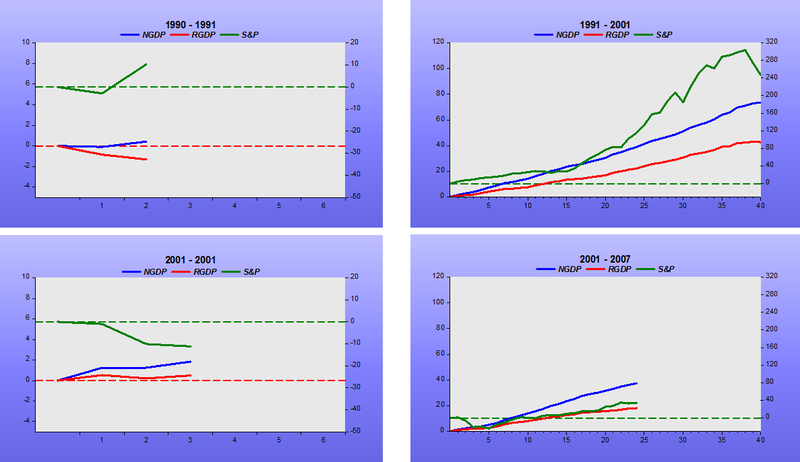 While in the expansion phase the behavior of real output and NGDP were similar to the previous expansion, stock prices were lackluster. The expansion was cut short, giving rise to the Great Recession. 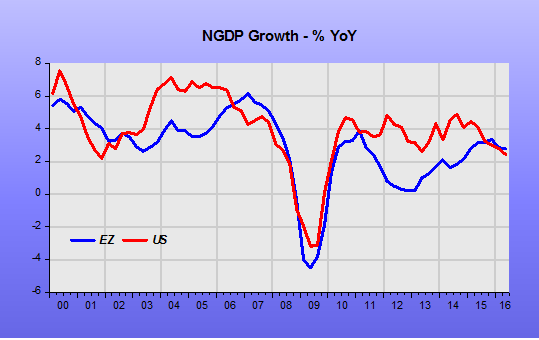 The 2007-09 contraction was a different animal altogether, with things becoming much worse when NGDP tumbled. The strength of the expansion has been held back by a tight monetary policy, where NGDP, after falling substantially in the contraction phase, is growing at a much smaller rate than during the previous two expansions. Since the 2009 trough, stocks prices have shown a robust recovery, but that has petered out since mid-2014, when the Fed began the rate hike talk. In 2008 monetary policy errors were perfectly “coordinated”! Which put much of the world economy in a perma-depressed state. With nominal spending (NGDP) level and growth as low as they now are, igniting inflation will be nothing short of a miracle, but central banks just “don´t let go”! The images tell a “depressing” story. Almost alone among economic commentators we do actually look at Nominal GDP data as it is released. Full Euro Area NGDP data for third quarter 2015 was released this week alongside the 2nd estimate of Real GDP. 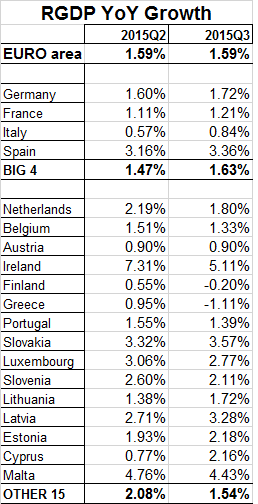 We have already posted here and here on the good news as three of the “big 4” Euro Area countries, making up 75% of the Euro Area economy, had seen accelerating NGDP. The not so good news is that the little countries saw less acceleration; in fact, it looks as though they saw slower growth. It is a bit hard to be exactly precise as the Irish GDP data, both nominal and real does not appear to conform to Eurostat norms. 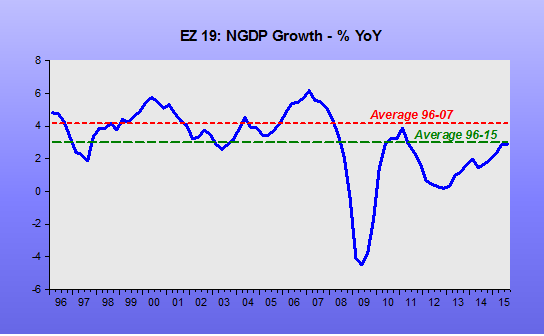 Ireland appears to have been growing NGDP at between 5% and 10% for a couple of years now. The result is that Euro Area NGDP, according to the first estimate for this figure, is still picking up but 3Q in total showed growth flattening. It is still below the average growth rate for the last twenty years, a period including the last disastrous seven years. 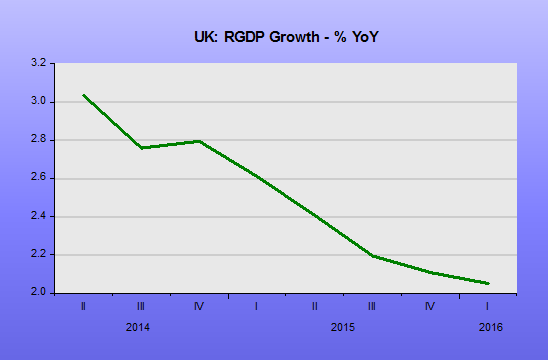 RGDP is growing marginally above this trend. The question of trends is important. 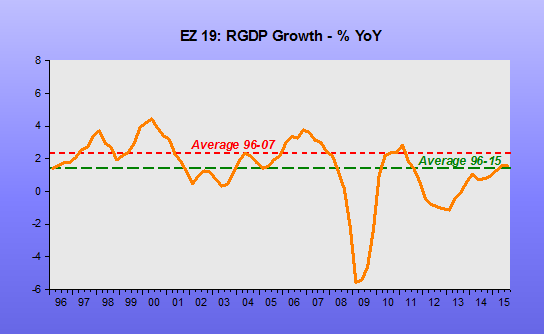 If we took the trend from 1996 to 2007 then the current Euro Area NGDP and RGDP growth rates looks awful. What should be unquestionable is the dangers of too low NGDP growth, the only unanimous conclusion of fifty years of macroeconomics. Low or negative NGDP growth causes unemployment and welfare loss – as we are seeing now occurring in Switzerland and have seen in many monetary areas since 2007. What is too low NGDP growth? Perhaps around 2% given long-run productivity growth of over 2%. Economies work best when they have decent flexibility to allow relatively declining economic sectors the ability to decline gently via declining real returns. And economies work very poorly when there is there is an ever-present threat of negative NGDP growth. It is very hard to see what is wrong with at least a 4% NGDP level target. Prosperity must be a more important goal than inflation. 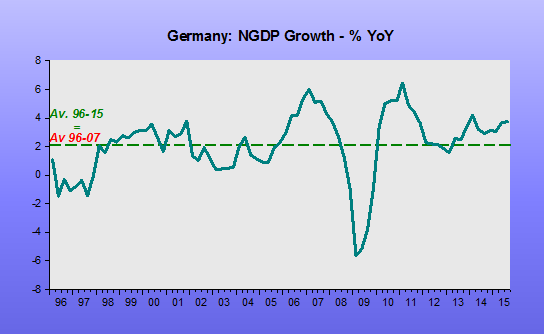 Have we spotted the reason for stiffening German opposition to more QE? 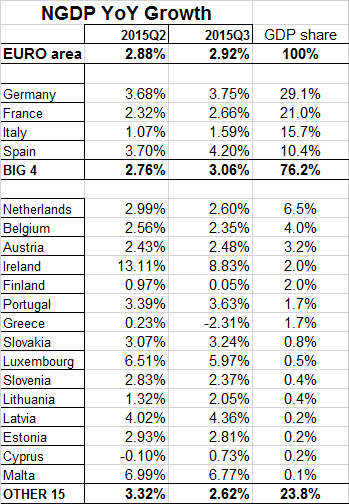 Another way of understanding the dynamics of the Euro Area and its monetary policy is to look at the performance of Germany, 29% of total GDP, and the most nationalistic and selfish country within the Area when it comes to monetary policy. We have seen time and again that what Germany considers right for itself it considers right for the entire Area. Maybe they are right not to care as they are now nearly 30% of the total. But here we see the essence of the current problem: narrow and often wrong-headed national interest. The Centre for European Reform has proposed an interesting reform of ECB governance to deal with just this issue via a removal of national central bank influence on the board. 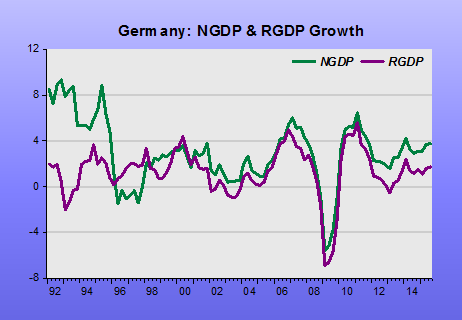 German NGDP is growing above trend again, as is its RGDP. 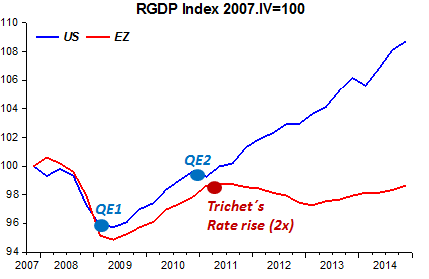 Twice Germany was growing so fast it authorised and encouraged the “inflation-nutter” Trichet to his satisfy his mania and crash the Euro Area economy. There are clear signs the Germans are ratcheting up this pressure again. Fortunately, Draghi is no inflation-nutter. However, he is still trapping himself with the insanely restrictive “close to, but below, 2%” non-flexible inflation target or ceiling. One that only huge amounts of QE can even partially offset. The natural, normal, “good Europeans”, thing for Germany to do would be to enjoy faster nominal growth than other Euro member states and gradually see itself become less competitive and gradually fall back to relatively less strong growth for a while. Surely, this relative decline would be more in Germany’s longer-run self-interest, rather than crashing the Euro Area economy as a whole again, and probably growing more slowly than it would have done otherwise. Last week Eurostat released the 3Q15 RGDP numbers of the Euro Area. The numbers were OK and broadly in line with expectations. They aren’t that interesting to Market Monetarists, we want to see NGDP numbers. For what it is worth Euro Area RGDP growth YoY in 3Q15 was up at 1.6% vs 1.5% for the 2Q15. Slightly better news, although it should be remembered that these are very early estimates. Frustratingly, Eurostat doesn’t release the NGDP until 10 weeks after the end of the quarter. We only get NGDP numbers for selected European countries. Here there was better news for France, especially. French RGDP came in line with expectations at 1.2%, up from 1.1%. Small changes on small numbers, I know, but at least heading in the right direction. 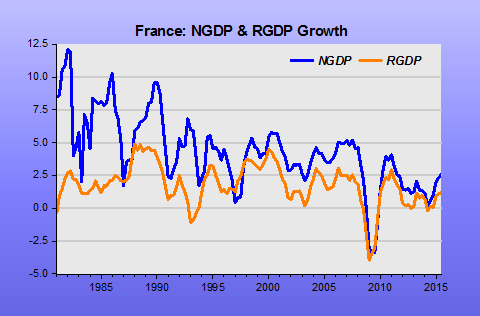 But French NGDP accelerated to 2.7% YoY dragging up that RGDP. It looks like the French long-term RGDP growth rate has been around 1.5% since 1990 or 1.8% if you include the more volatile, but higher RGDP growth, 1980s. 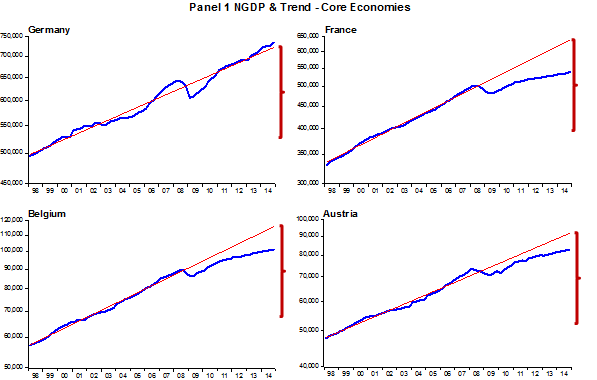 In order to get just the 1.5% real growth, France needs 3.2% NGDP growth. In order to get to the heady heights of 1.8% France has historically had to “endure” (irony alert!) 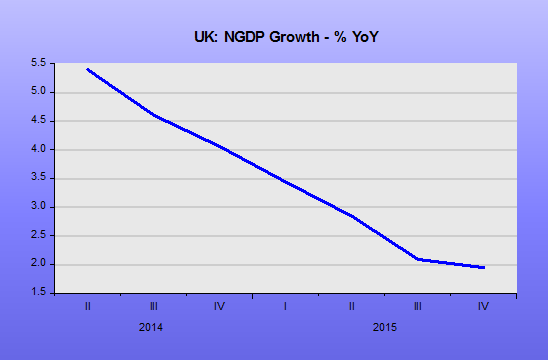 4.3% NGDP growth. 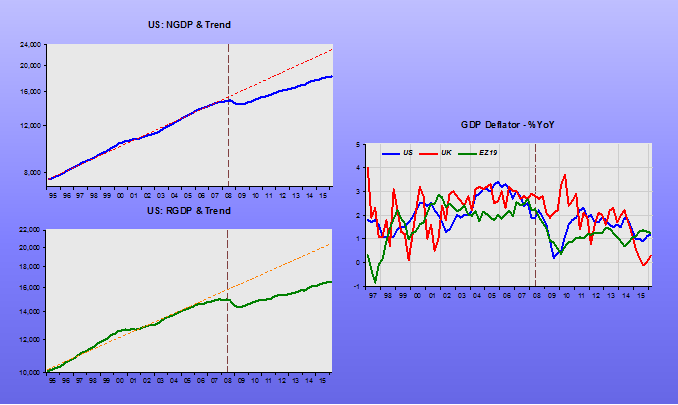 Market Monetarists suggest a target for expected NGDP Growth of 5% for the US, in line with long-run averages. If France could also cope with 5% NGDP growth, who knows, she might get over 2% RGDP growth. Would 3% inflation be such a disaster? Obviously, if it led to a volatile NGDP growth as seen in the 1980s, maybe not. But target a steady 5% and who knows what RGDP might be able to deliver! And what additional human happiness might higher RGDP engender, to help ward off greater tragedies. Lars Christensen posted a link to a fascinating piece the other day, testing for a link between NGDP shortfalls and freedom. ECB monetary policy makers and their political masters should take a look. Inflation doesn’t lead to the loss of freedom, but deflation does. What a lot Jean-Claude Trichet has to answer for in trying to prove that French central bankers could be as hysterically anti-inflation as German central bankers. But then France experienced a similar failure in the 1930s, with the most extended Great Depression of any major country. They never seem to learn. Thank you, someone, for Mr Draghi! 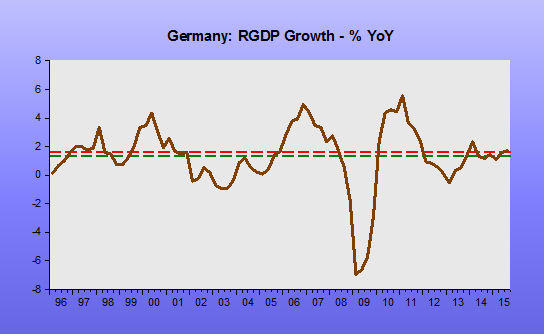 For balance, we have also examined German RGDP growth. Over the last 25 years, which includes the unification boom and bust, Germany has averaged just 1.3% average RGDP growth, lower than France. 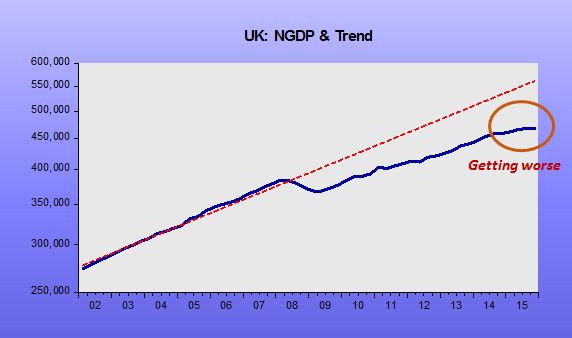 And NGDP growth has only been a tad lower at 3.0%. Momentum in the last few quarters seems to be with France. We hope it will continue. The good thing about the encouraging trends is that the ECB seems very concerned with low headline inflation and is set to ease policy further. Sadly, by “easing” we only expect more QE for longer, i.e. more pushing water uphill rather than the simpler, more effective and quicker option of just altering the targets. The first step to really effective easing would be to raise the inflation target and do away with the crushing, dispiriting, and downright counter-productive “close to, but not above 2%” language and adopt flexible inflation targeting or, better still, the ECB should suggest adopting NGDP level targeting and stop chasing such flaky and meaningless numbers as HIPC. Germany is not fit to lead! The financial crisis broke out seven years ago and led many countries into an economic and debt crisis. A pervasive set of myths — that the European response to the crisis has been ineffective at best, or even counterproductive — is simply not accurate. There is strong evidence(!) that Europe is indeed on the right track in addressing the impact, and, most importantly, the causes of the crisis. Let me run through some of these myths. My diagnosis of the crisis in Europe is that it was first and foremost a crisis of confidence, rooted in structural shortcomings. Investors started to realize that the member countries of the eurozone were not as economically competitive or financially reliable as the uniform bond yields of the pre-crisis years had suggested. These investors began to treat the bonds of certain countries with much more caution, causing interest rates for those bonds to rise. The cure is targeted reforms to rebuild trust — in member states’ finances, in their economies and in the architecture of the European Union. Simply spending more public money would not have done the trick — nor can it now. The priorities for Germany, as the current president of the Group of 7 nations, are modernization and regulatory improvements. Stimulus — both in fiscal and monetary policy — is not part of the plan. When my fellow finance ministers and the central bank governors of the G-7 countries gather in Dresden at the end of next month we will have an opportunity to discuss these questions in depth, joined — for the first time in the G-7’s history — by some of the world’s leading economists. I am confident that we can reach some common ground in Washington in advance of that meeting. Maybe Germany´s Finance Minister has a “euro death wish”! A real Greek exit, not just Grexit, is upon us, ever more likely. With that the whole will be broken and the euro will be perceived as just another (likely to fail) fixed exchange rate arrangement! 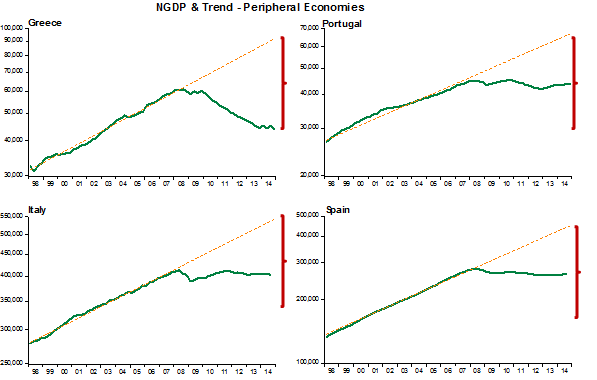 The NGDP contrast between core and periphery (with Greece as the “benchmark). Schaüble´s idea that “many European countries are reaping the rewards of reform and consolidation efforts” is risible. 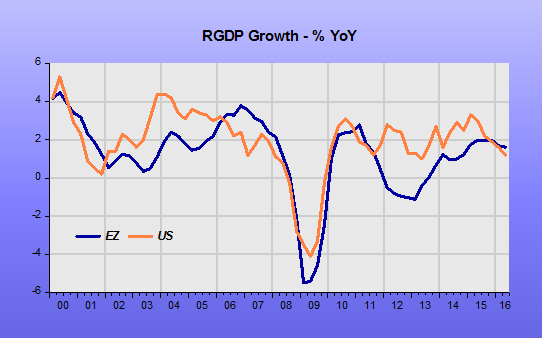 Just compare RGDP in the EZ with RGDP in the US since the 2007 cyclical peak. I wonder who “some of the world´s leading economists” attending the G-7 will be. 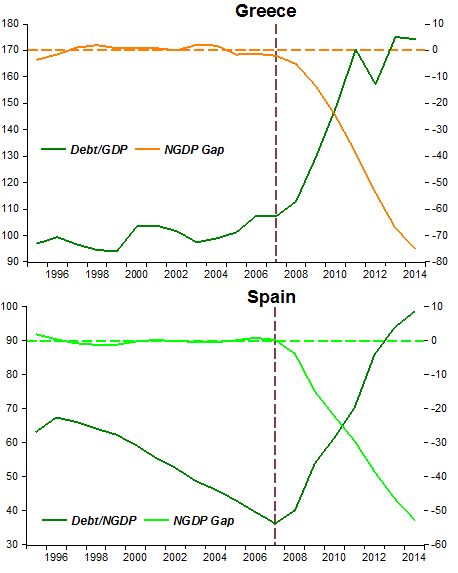 Update: You really can´t square Schaüble´s “The financial crisis broke out seven years ago and led many countries into an economic and debt crisis” with the facts, especially regarding Spain, whose debt/gdp at 36% in 2007 was one of the lowest in the EZ (and at that point Spain was running a fiscal surplus!). It looks and feels like a monetary induced NGDP crisis!